I've been enjoying this series about a lonely teenager who can see spirits since I first stumbled across it, and have been picking up more volumes as I find them. I picked up this one from Barnes and Noble, and from the cover art it looks as though it will be introducing a new character. [The TV Tropes entry for the series can be seen here.] It tends to be a gentle series, with touches of humor, creepiness, and poignancy, in mostly stand-alone stories and a few ongoing arcs - and I like it very much. 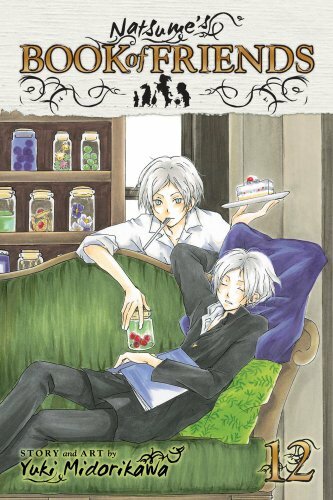 The first tale in this volume deals with a pair of human lovers who are parted when he leaves to take on family duties without giving her any notice. A yokai who's been watching their romance feels sorry for her and imitates her lover's voice in order to make her happy - but eventually runs away when she insists on seeing him and realizes what he's done. Years later he returns and finds a note she left - but the paper's falling apart and can't be read... and that's where Natsume comes in. Nice little tale with a touching conclusion. From that sweet opening, things get darker: a "hag" yokai curses Natsume when he won't agree to help her find a "very dangerous" yokai that she's sought for a long time. He's saved from the worst of the attack by a little chipped cup that has become a yokai itself (the Japanese concept of inanimate objects taking on life if they last long enough), and eventually solves the hag's problem as well, but things look dicey there for a bit. The next tale mixes some comedy in: a yokai traps Natsume in a jar, and Nyanko-sensei (his cat-guardian) takes on Natsume's form so his family and friends don't know he's been shrunk and captured. They need to find the one who did this in order to get the spell reversed, but that could be tricky: it seems Natsume's destined to be a gift to a powerful yokai. His friend Tanuma, who can hear yokai but not see them, figures out what's happening and offers to help, but this involves following Natsume's captor into a mass gathering of yokai, a very dangerous situation indeed! I'm adding this book to imawinn2’s Magical Mystical bookbox, which will be on its way to its next stop soon. Enjoy! I've only read this series sporadically, and not in order. For the most part, the stories are self-contained, but I definitely realized I had missed some changes in Natsume's life. I think the first and last stories were my favorite out of this volume. The first one has a very classic fairy-tale/mythology-based feel to it, and I admit to being fond of the melancholy tone. The aspect I enjoyed in the last, multi-part story was getting to see Natsume interacting more with some folks who have similar abilities and his relationship with other humans. Contrasting his personality and behavior with his grandmother's sets up an interesting conflict. Sent to the winner of the Graphic Novels/Manga Sweepstakes. I saw that they had an earlier volume of this series on their shelf, so hopefully they don't mind more turning up!